Having received a box of chocolates, Emma discovers the accompanying gift card states, "Mrs. Peel—We're Needed!" At her apartment, Emma discovers Steed's secret fear: Running out of champagne! Key businessmen in the ceramics industry are literally being scared out of their wits. Our duo discovers that a business efficiency firm has taken its client's directive to "eliminate competition" far too literally. 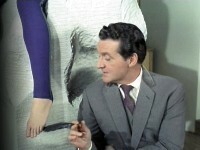 To catch them in the act, Steed poses as an entrepreneur, and names Mrs. Peel as his only competitor. Sorry to say this episode has some fatal flaws, aside from being uneven and generally uninteresting. For one thing, there was no believable motivation for the business efficiency bureau to go to such lengths for the sake of one wimpy ceramics businessman; they desperately needed some sinister ulterior motive, such as a plot to overthrow the government or whatever. For another, it was painfully evident that the balding, middle-aged Brian Wilde was mis-cast as Raven, given the frequent references to his being a "very young businessman." They should have swapped him with Jeremy Burnham, who played a much more youthful Gordon White. Peripheral to the idea of mixed-up casting, I wonder about the character names. Avengers stories often feature cute associations between name and nature. We have Meadows afraid of open spaces—that works. Fox is afraid of mice—well, not so great, but I won't belabor that one. Crawley is afraid of speed—acceptable. But White is afraid of birds, and Raven of spiders, and therein lies the inconsistency. The solution would have been to make White afraid of speed (white knuckles—get it? ), Raven of birds, and Crawley of spiders. So, have I beaten this dead horse enough yet? Allan G. of New York reports that Raven's burping, bleeping ceramics machine sound is "taken from a classic British film. It's from The Man In The White Suit starring Alec Guiness. He plays a scientist who invents a fiber that can't be torn, stained, etc. His device for doing this makes the same sounds (and more) as Raven's machine in this episode - a definite aural cue for British watchers of that time." Fox, the chap working out in the gym who is hospitalized after seeing a mouse, demonstrates his "fearlessness" by breaking a block of wood (which just happened to be sitting conveniently next to his rowing machine) with a quick karate chop. But this little visual aside has double meaning: Bernard Horsfall, who plays the character, was also karate expert Jephcott in "The Cybernauts," wherein he also split a block of wood in similar manner. Declan Mulholland's role is a curious one. He receives screen credit, and his character even has a name (Saunders), yet he is only glimpsed as the chubby fellow struggling with weights in the background. Such brief, non-speaking parts usually do not receive credit (indeed, even many speaking ones don't). This leads me to suspect he may have had a larger part that wound up on the cutting room floor. Guest actor and doppelganger Jeremy Burnham went on to write five Tara King episodes. According to Television's Greatest Hits, this was the top-rated episode for this year, and ranked second of all Avengers episodes according to viewer ratings at the time it aired. It may come as a surprise what the other top-rated episodes were. Acronym Alert: BEB is the Business Efficiency Bureau and CPC is the Central Productivity Council. Raven demonstrates a burping, bleeping ceramics machine that is supposed to produce any desired ceramic object—but in actuality produces a blob. Classic British humor.